It is with deep sorrow that we share news of the passing of our Housing Program Coordinator, co-worker, and friend, Ms. Kimberly Ann Vicars. Kim began her career with Big Sandy Area Community Action Program in 2004 as a Community Service Worker. In 2008, she became a Community Resource Representative and then was promoted to Community Service Block Grant (CSBG) Program Manager in 2015. This year, Kim became BSACAP’s Housing Program Coordinator. During her life, Kim helped the people of the Big Sandy region to have clean and safe places to live, access healthcare and educational opportunities, stay warm in the winter, grow gardens in the spring, and to care for their children and themselves. Among her friends and co-workers, Kim was loved for her intelligence, wit, hard work, and generous heart. BSACAP has lost one of our organization’s greatest assets. Our thoughts and prayers are with her family. With heavy hearts, we share our friend’s obituary and funeral arrangements. 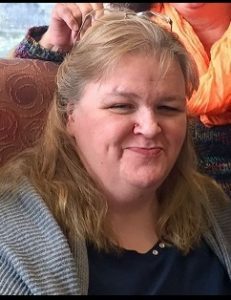 Kimberly Ann Vicars, 50, of Melvin, died Wednesday, Nov. 21, 2018, at Wheelwright. She was born in Floyd County, Friday, June 21, 1968, the daughter of the late Franklin D. and Bessie C. Casebolt Vicars. She is survived by one brother, Ronnie Vicars (Cara), of Melvin; one sister, Venita Lynn Anderson, of Robinson Creek; a special nephew, whom she thought of as a son, Justin Anderson; and many other loving family and friends. A memorial service will be held at 1 p.m., Wednesday, Nov. 28, 2018, at the Wheelwright Freewill Baptist Church, with Louie Ferrari officiating. Arrangements are under the direction of the Community Funeral Home of Zebulon. She will be sadly missed by all those who knew and loved her. The guestbook may be signed at www.communityfuneralhomeky.com.